Red Dead Redemption II may not be on PC yet, but now it’s available on your body. A New York clothier has released a small line of apparel based on Red Dead Redemption II protagonist Arthur Morgan’s personal wardrobe. There’s a jacket, several shirts, and some bags to choose from in the line, which is available now. The limited edition collection is presented by New York-based Barking Irons, and the items shown are available to order online. It’s four shirts and a jacket that are inspired by the rugged frontier depicted in Red Dead Redemption II (in other words, they’re what Rich and Ali call “clothes”), but they don’t go crazy with the videogame branding. There are two striped cotton button-up shirts, one in denim, and a bone white henley to pick from, as well as a “gunslinger jacket” in wax cotton and leather. Polygon noticed the line this week. The pieces all fairly understated and even sharp-looking, which makes them quite a bit less silly than some of the Assassin’s Creed clothing we’ve seen in the past. Awkwardly, the collection also includes three bags, including a large canvas tote – despite what we’ve heard recently about “materials shortages” when it comes to constructing canvas bags. You can browse and order the Red Dead Redemption II collection at Barking Irons website. 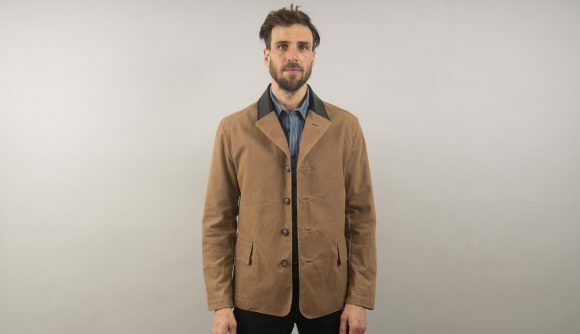 If you’re outside the US, they’ve got a European site as well, which may save you money on shipping if you think you’d look good sporting Arthur Morgan’s style. The shirts range from $92 USD (£72 GBP) to $150 (£120). The canvas bag costs $75 (£65).